What Is an EA Designation for Tax Professionals? A tax professional who has an "EA" designation is an enrolled agent. He's a tax professional who has passed an Internal Revenue Service test covering all aspects of taxation. He must also have passed an IRS background check. He is literally a tax expert. He's "enrolled" because he is specially licensed by the federal government, and an enrolled agent is the only type of tax professional who has this type of relationship with the IRS. There are about 55,000 EAs in the U.S. as of 2018. Having a college degree isn't necessary, but an enrolled agent must take the IRS Special Enrollment Examination (SEE). It's eight hours over two days, and it covers all aspects of federal tax law, including taxation of individuals, corporations, and partnerships. It includes various regulations governing IRS collections and audit procedures. The exam is three parts, and enrolled agents must achieve scaled passing scores of at least 105 in all three sections: one for personal tax issues, one for business taxes, and one regarding procedural issues and representing clients. If an agent passes one or two sections, he can "save" those passing scores for up to two years and just retake the portion he didn't achieve a passing score on. The test can be taken from May 1 through the end of February of the subsequent year. This allows the IRS two months' time to update the test annually to accommodate current tax law. 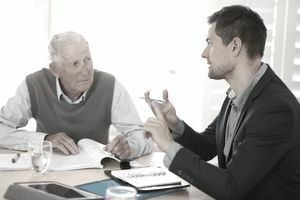 A tax professional can also qualify as an EA if he has worked for the IRS for at least five years in a position that requires extensive knowledge of the tax code and its applications. Of course, simply passing the SEE or working for the IRS for five years is almost too easy. We're talking taxes and the IRS here, after all, and this is a prestigious designation. EAs must also have or obtain a Preparer Tax Identification Number (PTIN) from the IRS, but this is required of anyone who prepares or even helps a taxpayer prepare a federal tax return. This is an ongoing requirement. PTINs must be renewed periodically. An enrolled agent must additionally pass a "tax compliance check." Her own personal tax records must be in order. She can't owe the IRS and all her returns due to date must have been filed. Like CPAs and tax attorneys, EAs can handle all types of tax matters and can represent their clients' interests before the IRS. The client does not necessarily have to be present—EAs are authorized to appear in place of their clients. Enrolled agents focus exclusively on tax accounting, but this includes audits, appeals, and collections. EAs have some limited client privilege under the terms of the IRS Restructuring and Reform Act of 1998. The Act provides for confidentiality between the agent and his client under some circumstances involving audits and collections. Your EA does not have to divulge information to the IRS that you've confided in him unless it concerns the preparation and filing of your tax returns. EAs must complete 72 hours of continuing education courses every three years. Those who are also members of the National Association of Enrolled Agents (NAEA) must complete 30 hours per year for three years for a total of 90 hours. The EA designation can be revoked for malpractice by the IRS Office of Professional Responsibility. Enrolled agents are held to the standards of the Department of Treasury's Circular 230, which lists IRS regulations. NAEA members must additionally comply with the Association's code of ethics and rules of professional conduct or they risk losing their memberships. How Can You Find an Enrolled Agent? EA eligibility is stringent and exacting, so it should come as no surprise that many EAs advertise their status—deservedly so. You should find the "EA" designation following their names in professional directories or even in the Yellow Pages or online. You can also call 800-424-4339, an EA referral service, or visit the NAEA website for a complete list of current agents. Keep the continuing education and ethical requirements in mind if you select someone from a directory or the phone book, however. An EA yesterday might not still be an EA today. Do a little homework and check with the EA referral service or the NAEA as well. You can also verify an enrolled agent's status directly with the IRS.